It has been a pretty grim fall back in Southern Ontario for the first time in four years. October and November have been mostly raining and cold. With Winter seeming to be coming early there is one benefit….Snowy Owls are coming south already. I looked up sightings on eBird last week and saw a sighting on Lake Simcoe. Since we were going to be up in Bradford area this was a simple side trip on a rainy day but turned out that we were unable to find it. Salwa was supportive as usual but spent most of her time trying to keep warm in the car. Grim morning on Lake Simcoe. Snowy owl was seen in this area the day before but no luck on this day. This weekend there were some more sightings, and another one up near Lake Simcoe so we headed out to some farmers fields to see what might be around. I guess you could say we had better luck, found an owl and it was a beautiful male, but….it was far out in the field sitting on the ground and it was bloody cold and windy. You probably can’t pick it out, not sure how I did but there is a tiny white spot out there near the barns. Camera is set up, time to wait and watch. 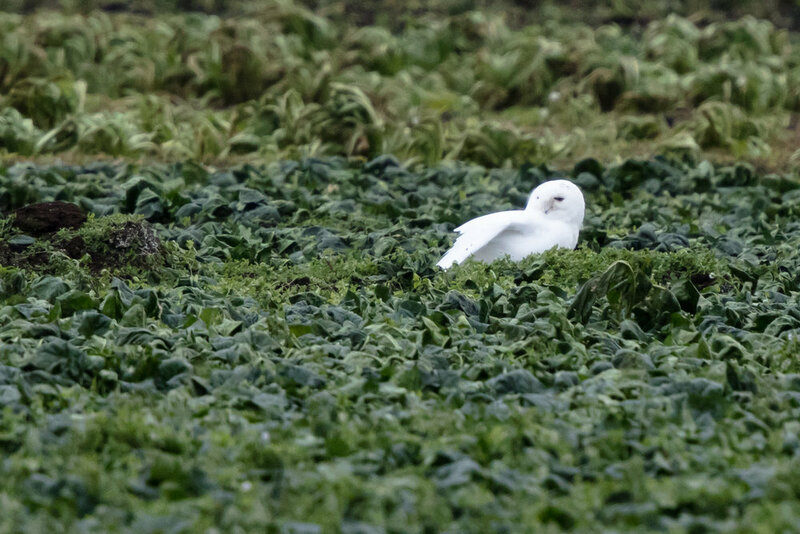 Still, this is the first very white male that I have seen and there is always the possibility that it will come closer so I set up the tripod, took out the 500mm with the 2x teleconverter on the Canon 5DS grabbed my coffee and stood in the cold and waited. Snowy owl sitting off in the distance, even with 1000mm I’m going to have to crop like crazy to get anything. …..and waited…..the owl was pretty active, watching gulls and crows above him and taking a look at me every once in a while. Massive crop of the last image, not the detail level that I would like to have but nice to capture a few shots of this owl. …..and waited, nice to see it in this sea of green but I was still hoping it would fly. ….and waited, it started preening its feathers and stretching. Usually a good sign that it might take off but not this time. I’m sure if I could have waited the rest of the afternoon I would have gotten something but the chill was setting into me and coffee was calling. For about an hour and a half I watched in the cold, Salwa is patient but this bird was not going anywhere soon. At least I got a few shots and hopefully this owl will stay in this area for a while. Nice to have a couple of shots even if they are massively cropped, and the anticipation of the next owl will keep me going.